Recently, someone on Facebook posted this link. It described a doctor who made a mistake during a procedure and refused to admit it. Later, when he remembered an incident from childhood when his doctor had done something similar to him as the patient, he went back and apologised to the patient. This led me to think about simple mistakes that healthcare workers make. We all find it difficult to admit our mistakes. It is human nature. However, when there is a possibility of being penalised for the mistake, then the disincentive to admit it is even higher. This can lead to some dangerous consequences. Let us take an example. A nurse in a hospital has to do a number of procedures ranging from the really simple to some that are fairly complex. Let us say that while opening a syringe, the needle unintentionally touched a non-sterile surface. The best thing to do would be to discard the syringe and use a new one. However, if the hospital had a stringent inventory control process and the staff was penalised or scolded for using excess consumables, then what was the nurse likely to do? Human nature would make him continue to use the same syringe. Who wanted to be penalised for this? Who wanted to answer questions from the audit team? 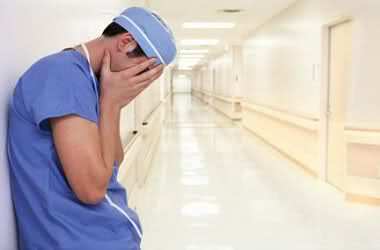 At the end of the day, the patient would be the one who would suffer the most. This could potentially cause a serious infection depending on what the syringe was being used for. So, while it is important for the Inventory team to do its job and ensure that operations are run in a prudent manner, hospital authorities need to figure out ways by which situations like the above can be avoided. While Inventory shortages were easy to identify, it is very difficult to identify the real cause of, in this case, an infection. Often, from the point when something like this happened to it actually manifesting itself in the form of symptoms, a lot of time has passed. So many things could have happened in the interim. How can anyone, then pinpoint that usage of that contaminated syringe caused the infection? This makes it easier for the nurse to continue to use the syringe rather than discard it and take a new one and then be reprimanded by the authorities for not being more careful. What could be the possible solutions? I think the first thing that needs to be done is to remove any financial penalty on the individual that commits the mistake. This can be the worst way to fix the issue. Assuming that a financial penalty, (especially when the stakes are so high) would cause the staff to be more careful in such cases is wrong. Hospitals should allow for such instances while putting SOPs in place. Staff should be encouraged to document such instances so that audits can take these into account without any reprimands or penalties. In some cases, proper training and education can also help avoid repeated mistakes. Healthcare poses such challenges all the time. There is a very thin line between prudence and foolishness. Crossing this line can harm patients. At times, this harm can be irreversible. It is upon the administrators to identify the ways in which this can happen and fix the issues.